I love Cookies. Period. 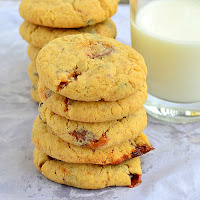 And this eggless candy cookie recipe is even more special to me because it has one of my most favorite candy, Snickers. My kids are absolutely crazy about Snickers, so its no wonder they were gifted a load of it during my little one’s birthday by his friends. I had to literally hide some from them as I did not want the boys to be on a Chocolate high. When the snickers bars finally dwindled down to just 3, I wanted to add them in a cookie as I had some cake flour left out after baking the Eggless Vanilla Sponge Cake, and it came out so well. The yummy gooey caramelized candy along with the crunch of the nuts and chocolate chip is a treat in itself. I adapted this recipe from my Eggless M&M Cookies, which will also add a colorful treat to any birthday party. We, the Avant Garde Cookies are celebrating our first anniversary and we decided to bake cookies for our second week. Having named ourselves as the cookies, we did not want to leave out the actual cookies. And what a treat this Snickers Cookie turned out to be. You can very easily halve the recipe or double it as well. Honestly I would not mind having them for breakfast itself. Preheat oven to 180 C/350 F. Grease a flat baking tray and keep it ready. I used my non stick tray, so did not grease it. Sieve together flour, corn flour, salt and baking soda together. Chop the snickers candy into small bite sized pieces. In a mixing bowl, cream together butter, sugar and brown sugar well. You can use your hand mixer to do the job but I just used the balloon whisk. Add in vanilla essence and mix well. Add the flour in 2 batches and mix well. Now add the chopped snickers candy bars and chocolate chips and mix well. The mixture will be a crumbly mass. Now add either milk or cream and mix with your finger tips. Make small balls, the size of a walnut and arrange on the baking tray leaving a gap of 2 inches in between them. Bake for 10-15 minutes or till the edges become golden in color, crisp and firm. Take the tray out, and the cookies cool in the pan for 10 minutes or so and then transfer them to a wire rack to let them cool completely. Store in a cookie jar and enjoy with a chilled glass of milk. If you want a thick sturdy cookie, then I would recommend to refrigerate the cookie dough for at least 30 minutes. The cookies would look wobbly after the baking time, but it will form up after cooling off. So do not over bake them. The candy will melt down sometimes and leak out of the cookie as you can see but then its normal only and if you had greased the pan, it will come off easily without creating any mess. If you wish, you can also add chopped nuts along with the chocolate chips for an added crunch.